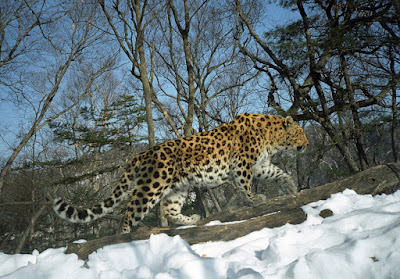 A camera-trap image of an Amur leopard in the Russian wilderness. 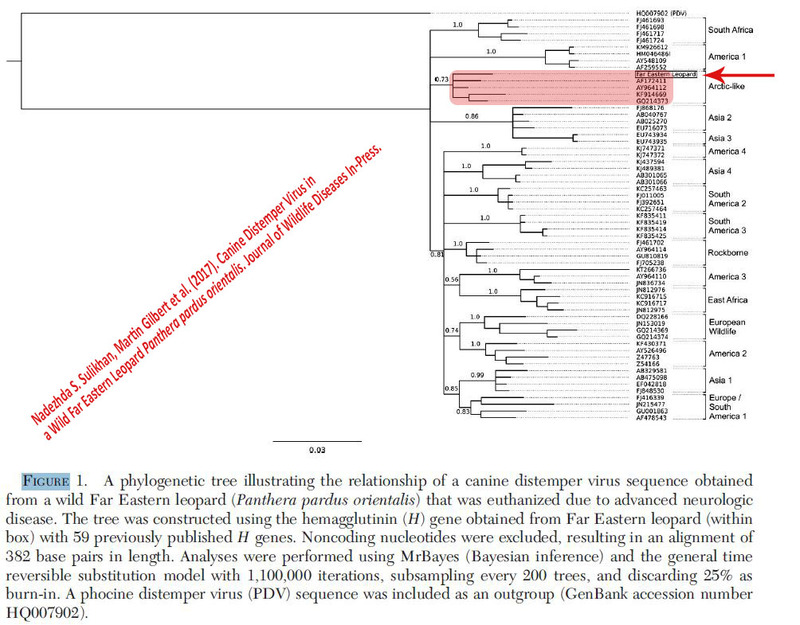 A first case of fatal CDV infection in a wild Amur leopard (subspecies, Panthera pardus orientalis) was diagnosed based on detection of the viral DNA sequences in brain tissue of the deceased leopard. The case was diagnosed in a female leopard of approximately 2 yr old in the Russian territory of Primorskii Krai during May 2015. It was found close to a road that runs through the Land of the Leopard National Park in Khasanskii district. Upon initial approach, the leopard was showing a lack of fear toward people and vehicles, and quite unconcerned about its surroundings. It was then tranquilized and taken to Alekseevka PRNCO “Tiger Center” for medical attention. Despite continuous medical care and support for more than 2 weeks, its conditions kept on deteriorating and ultimately euthanasia was performed for ethical motive. A team of scientists at Wildlife Conservation Society, Cornell University and other organizations from Russia, USA and UK jointly led a scientific investigation on the case. The investigation detected clinical symptoms and signs in the brain tissue of the deceased animal which was consistent with advanced neurologic disorder associated with CDV infection. A phylogenetic analysis was performed to study inter-relationship between the leopard CDV strain and those from other regions, which showed that the CDV strain from leopard fell within Arctic-like clade, which also included those from Amur tigers (Panthera tigris altaica) in the Russian Far East and Baikal seals (Phoca sibirica) from Lake Baikal in the southern Siberia. that also include strains from Amur tigers and Baikal seals. Image source: Sulikhan & Gilbert et al. 2017. Typically, the symptoms of CDV infection in dogs include upper respiratory disease with or without systemic signs such as pyrexia, dermatitis, hyperkeratosis or enteritis. Neurologic signs often follow but are not usually present in all cases. In contrast, the present case in leopard exhibited severe neurologic disease with no any symptoms associated to respiratory or systemic disease. The genetic amplicons of the virus were detected only in brain tissue but not in lung tissue. Scientists thus warrant investigation on pathogenesis of CDV in wild felids having potential important epidemiologic implications. Amur leopards are the most critically endangered subspecies of leopard, with approximately 60 to 80 individuals left in the wild. CDV infections are normally short-lasting and require spillover quite often to maintain viable circulation in a population. The leopard population being too small, the scientists suggest that the spillover could be occurring from other domestic or wild carnivores such as dogs, raccoon dogs (Nyctereutes procyonoides), sable (Martes zibellina) and Asian badgers (Meles leucurus) that are more abundant in Primorskii Krai. The research article has been published on August 25th, 2017 in the online issue of Journal of Wildlife Diseases, Vol. 54, No. 1, January 2018.